Fake advertisements are being spotted around Venice, Calif. offices Friday in response to Google’s recent decision to fire engineer, James Damore, for criticizing the company’s diversity initiatives. 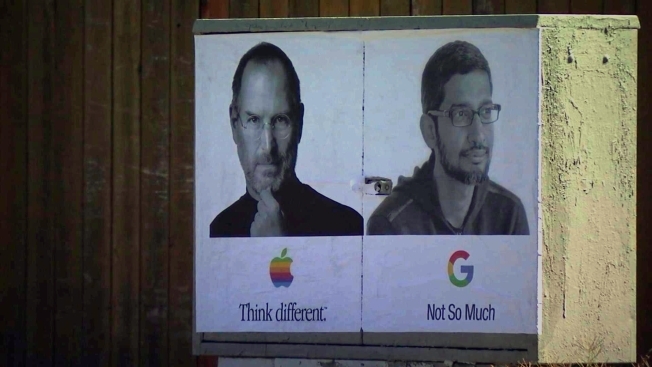 The ads spotted at various public benches and the tech companies Los Angeles offices, illustrate Steve Jobs’ "Think Different" Apple ad from 1997 next to a photo of Google CEO Sundar Pichai with the words "Not So Much" below his company's logo. A second version of the ad has been tweeted by several users showing the word Google refashioned to read "Goolag" with a search bar underneath stating, "Search for diversity of thought somewhere else," according to a report. The word "Goolag" not only plays on the word "Google," it appears to reference the Soviet system of forced labor camps known as "Gulag." An image of Damore recently surfaced on Twitter featuring him wearing a T-shirt with the words "Goolag." It is unclear who is behind the advertisements. NBC Bay Area has reached out to Google for comment.